Here is the trailer from the upcoming film ALL IS TRUE. The film is directed by Kenneth Branagh, starring Kenneth Branagh, Judi Dench, Ian McKellen, Kathryn Wilder and Lydia Wilson. ALL IS TRUE reveals a dramatic and little known period in the final years of William Shakespeare. Branagh is the playwright, Judi Dench is his wife Anne, and Ian McKellen plays the Earl of Southampton. The year is 1613, Shakespeare is acknowledged as the greatest writer of the age. But disaster strikes when his renowned Globe Theatre burns to the ground, and devastated, Shakespeare returns to Stratford, where he must face a troubled past and a neglected family. Haunted by the death of his only son Hamnet, he struggles to mend the broken relationships with his wife and daughters. In so doing, he is ruthlessly forced to examine his own failings as husband and father. His very personal search for the truth uncovers secrets and lies within a family at war. 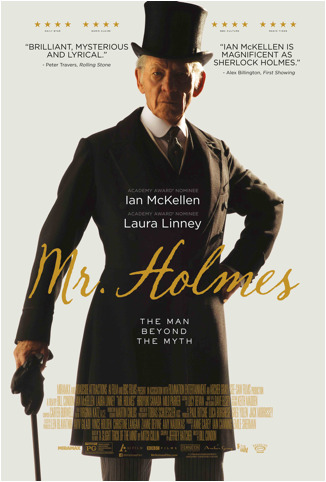 Here is the new poster for the upcoming film MR. HOLMES. The movie is directed by Bill Condon, starring Ian McKellen, Laura Linney, and Milo Parker. MR. HOLMES will open in theaters July 17, 2015. MR. HOLMES is a new twist on the world’s most famous detective. 1947, an aging Sherlock Holmes returns from a journey to Japan, where, in search of a rare plant with powerful restorative qualities, he has witnessed the devastation of nuclear warfare. Now, in his remote seaside farmhouse, Holmes faces the end of his days tending to his bees, with only the company of his housekeeper and her young son, Roger. Grappling with the diminishing powers of his mind, Holmes comes to rely upon the boy as he revisits the circumstances of the unsolved case that forced him into retirement, and searches for answers to the mysteries of life and love – before it’s too late. Here is the trailer for the upcoming film MR. HOLMES. The movie is directed by Bill Condon, starring Ian McKellen, Laura Linney, and Milo Parker. Here is the teaser trailer for the upcoming film MR. HOLMES. The movie is directed by Bill Condon, starring Ian McKellen, Laura Linney, and Milo Parker. MR. HOLMES will open in theaters in Summer 2015. “Dolphin Tale 2” continues the story of the brave dolphin Winter, whose miraculous rescue and recovery—thanks to a groundbreaking prosthetic tail—made her a symbol of hope and perseverance to people around the world and inspired the 2011 family hit movie “Dolphin Tale.” It has been several years since young Sawyer Nelson (Nathan Gamble) and the dedicated team at the Clearwater Marine Hospital, headed by Dr. Clay Haskett (Harry Connick, Jr.), rescued Winter. With the help of Dr. Cameron McCarthy (Morgan Freeman), who developed a unique prosthetic tail for the injured dolphin, they were able to save her life. Yet their fight is not over. Winter’s surrogate mother, the very elderly dolphin Panama, has passed away, leaving Winter without the only poolmate she has ever known. However, the loss of Panama may have even greater repercussions for Winter, who, according to USDA regulations, cannot be housed alone, as dolphins’ social behavior requires them to be paired with other dolphins. Time is running out to find a companion for her before the team at Clearwater loses their beloved Winter to another aquarium. When their father passes away, four grown siblings, bruised and banged up by their respective adult lives, are forced to return to their childhood home and live under the same roof together for a week, along with their over-sharing mother and an assortment of spouses, exes and might-have-beens. Confronting their history and the frayed states of their relationships among the people who know and love them best, they ultimately reconnect in hysterical and emotionally affecting ways amid the chaos, humor, heartache and redemption that only families can provide—driving us insane even as they remind us of our truest, and often best, selves. She terrified you in “The Conjuring,” but this is where it all began for Annabelle. Capable of unspeakable evil, the actual doll exists locked up in an occult museum in Connecticut—visited only by a priest who blesses her twice a month. New Line Cinema’s supernatural thriller “Annabelle” begins before the evil was unleashed. John Form has found the perfect gift for his expectant wife, Mia—a beautiful, rare vintage doll in a pure white wedding dress. But Mia’s delight with Annabelle doesn’t last long. On one horrific night, their home is invaded by members of a satanic cult, who violently attack the couple. Spilled blood and terror are not all they leave behind. The cultists have conjured an entity so malevolent that nothing they did will compare to the sinister conduit to the damned that is now…Annabelle. 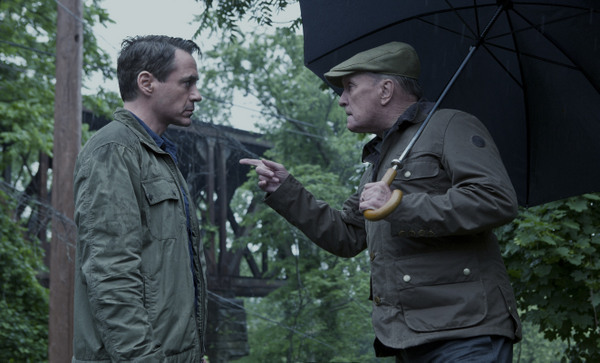 Hank Palmer (Robert Downey Jr.) returns to his childhood home where his estranged father, the town’s judge (Robert Duvall), is suspected of murder. He sets out to discover the truth and along the way reconnects with the family he walked away from years before. Fed up with answering to higher-ups, Nick, Dale and Kurt decide to become their own bosses by launching their own business in “Horrible Bosses 2.” But a slick investor soon pulls the rug out from under them. 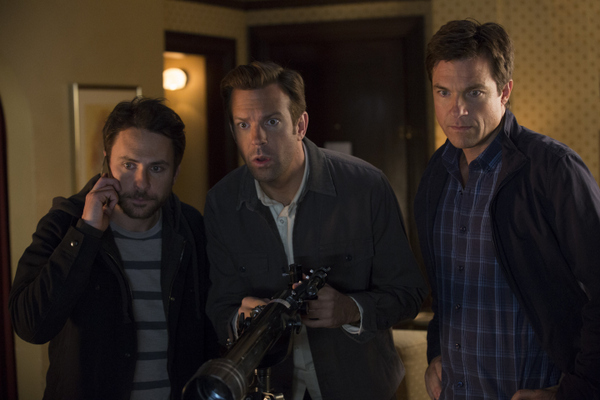 Outplayed and desperate, and with no legal recourse, the three would-be entrepreneurs hatch a misguided plan to kidnap the investor’s adult son and ransom him to regain control of their company in this follow-up to the 2011 hit comedy “Horrible Bosses” that reunites stars Jason Bateman, Charlie Day and Jason Sudeikis as everyone’s favorite working stiffs. Jennifer Aniston, Jamie Foxx and Kevin Spacey also reprise their starring roles, while Chris Pine and Christoph Waltz star as new adversaries standing between the guys and their dreams of success. “The Hobbit: There and Back Again” is the epic conclusion to Peter Jackson’s trilogy of films adapting the enduringly popular masterpiece The Hobbit, by J.R.R. Tolkien. The film concludes the adventure of the title character Bilbo Baggins, who joins the Wizard Gandalf and thirteen Dwarves, led by Thorin Oakenshield, on an epic quest to reclaim the lost Dwarf Kingdom of Erebor. From director Clint Eastwood comes “American Sniper,” starring Bradley Cooper as Chris Kyle, the most lethal sniper in U.S. military history. But there was much more to this true American hero than his skill with a rifle. U.S. Navy SEAL sniper Chris Kyle is sent to Iraq with only one mission: to protect his brothers-in-arms. His pinpoint accuracy saves countless lives on the battlefield and, as stories of his courageous exploits spread, he earns the nickname “Legend.” However, his reputation is also growing behind enemy lines, putting a price on his head and making him a prime target of insurgents. Despite the danger, as well as the toll on his family at home, Chris serves through four harrowing tours of duty in Iraq, becoming emblematic of the SEAL creed to “leave no man behind.” But upon returning home, Chris finds that it is the war he can’t leave behind. Here is the new trailer from upcoming film “X-MEN: DAYS OF FUTURE PAST”. The film is directed by Simon Kinberg, starring Patrick Stewart, Ian McKellen, Hugh Jackman, Michael Fassbender, James McAvoy, Jennifer Lawrence, Halley Berry, Nicholas Hoult, Ellen Page, Shawn Ashmore, Peter Dinklage, Omar Sy, Daniel Cudmore, Fan Bingbing, Boo Boo Stewart, Adan Canto, Evan Peters, Josh Helman, Lucas Till, Evan Jonigkeit. X-MEN: DAYS OF FUTURE PAST in select theatres on May 23, 2014. The ultimate X-Men ensemble fights a war for the survival of the species across two time periods in X-MEN: DAYS OF FUTURE PAST. The beloved characters from the original “X-Men” film trilogy join forces with their younger selves from the past, “X-Men: First Class,” in order to change a major historical event and fight in an epic battle that could save our future. Here is the trailer from upcoming film “X-MEN: DAYS OF FUTURE PAST”. The film is directed by Simon Kinberg, starring Patrick Stewart, Ian McKellen, Hugh Jackman, Michael Fassbender, James McAvoy, Jennifer Lawrence, Halley Berry, Nicholas Hoult, Ellen Page, Shawn Ashmore, Peter Dinklage, Omar Sy, Daniel Cudmore, Fan Bingbing, Boo Boo Stewart, Adan Canto, Evan Peters, Josh Helman, Lucas Till, Evan Jonigkeit. Set in Los Angeles in the slight future, “Her” follows Theodore (Joaquin Phoenix), a complex, soulful man who makes his living writing touching, personal letters for other people. Heartbroken after the end of a long relationship, he becomes intrigued with a new, advanced operating system, which promises to be an intuitive and unique entity in its own right. Upon initiating it, he is delighted to meet “Samantha,” a bright, female voice (Scarlett Johansson) who is insightful, sensitive and surprisingly funny. As her needs and desires grow in tandem with his own, their friendship deepens into an eventual love for each other. From the singular perspective of Oscar®-nominated filmmaker Spike Jonze comes “Her,” an original love story that explores the evolving nature—and the risks—of intimacy in the modern world. “The LEGO® Movie” is the first-ever, full-length theatrical LEGO® adventure. The original 3D computer animated story follows Emmet (Chris Pratt) an ordinary, rules-following, perfectly average LEGO minifigure who is mistakenly identified as the most extraordinary person and the key to saving the world. He is drafted into a fellowship of strangers on an epic quest to stop an evil tyrant, a journey for which Emmet is hopelessly and hilariously underprepared. Set in a mythic New York City and spanning more than a century, “Winter’s Tale” is a story of miracles, crossed destinies, and the age-old battle between good and evil. Based on Frank Miller’s latest graphic novel Xerxes and told in the breathtaking visual style of the blockbuster “300,” this new chapter of the epic saga takes the action to a fresh battlefield—on the sea—as Greek general Themistokles (Sullivan Stapleton) attempts to unite all of Greece by leading the charge that will change the course of the war. “300: Rise of an Empire” pits Themistokles against the massive invading Persian forces led by mortal-turned-god Xerxes (Rodrigo Santoro), and Artemisia (Eva Green), vengeful commander of the Persian navy. Dr. Will Caster (Johnny Depp) is the foremost researcher in the field of Artificial Intelligence, working to create a sentient machine that combines the collective intelligence of everything ever known with the full range of human emotions. His highly controversial experiments have made him famous, but they have also made him the prime target of anti-technology extremists who will do whatever it takes to stop him. However, in their attempt to destroy Will, they inadvertently become the catalyst for him to succeed—to be a participant in his own transcendence. For his wife Evelyn (Rebecca Hall) and best friend Max Waters (Paul Bettany), both fellow researchers, the question is not if they can…but if they should. Their worst fears are realized as Will’s thirst for knowledge evolves into a seemingly omnipresent quest for power, to what end is unknown. The only thing that is becoming terrifyingly clear is there may be no way to stop him. An epic rebirth to Toho’s iconic Godzilla, this spectacular adventure pits the world’s most famous monster against malevolent creatures who, bolstered by humanity’s scientific arrogance, threaten our very existence. After a disastrous blind date, single parents Lauren and Jim agree on only one thing: they never want to see each other again. But when they each sign up separately for a fabulous family vacation with their kids, they are all stuck sharing a suite at a luxurious African safari resort for a week in “Blended,” the third comedy collaboration between stars Adam Sandler and Drew Barrymore. The epic action of “Edge of Tomorrow” unfolds in a near future in which an alien race has hit the Earth in an unrelenting assault, unbeatable by any military unit in the world. Major William Cage (Tom Cruise) is an officer who has never seen a day of combat when he is unceremoniously dropped into what amounts to a suicide mission. Killed within minutes, Cage now finds himself inexplicably thrown into a time loop—forcing him to live out the same brutal combat over and over, fighting and dying again…and again. But with each battle, Cage becomes able to engage the adversaries with increasing skill, alongside Special Forces warrior Rita Vrataski (Emily Blunt). And, as Cage and Rita take the fight to the aliens, each repeated encounter gets them one step closer to defeating the enemy. Clint Eastwood’s big screen version of the Tony Award-winning musical tells the story of the four young men from the wrong side of the tracks in New Jersey who came together to form the iconic `60s rock group The Four Seasons. Their trials and triumphs are accompanied by the hit songs that influenced a generation, and are now being embraced by a new generation of fans through the stage musical. Tammy (Melissa McCarthy) is having a bad day. She’s totaled her clunker car, gotten fired from her thankless job at a greasy burger joint, and instead of finding comfort at home, finds her husband getting comfortable with the neighbor in her own house. It’s time to take her boom box and book it. The bad news is she’s broke and without wheels. The worse news is her grandma, Pearl (Susan Sarandon), is her only option—with a car, cash, and an itch to see Niagara Falls. Not exactly the escape Tammy had in mind. But on the road, with grandma riding shot gun, it may be just what Tammy needs. How far would you go to protect your family? Keller Dover (Hugh Jackman) is facing every parent’s worst nightmare. His six-year-old daughter, Anna, is missing, together with her young friend, Joy, and as minutes turn to hours, panic sets in. The only lead is a dilapidated RV that had earlier been parked on their street. Heading the investigation, Detective Loki (Jake Gyllenhaal) arrests its driver, Alex Jones (Paul Dano), but a lack of evidence forces his release. As the police pursue multiple leads and pressure mounts, knowing his child’s life is at stake the frantic Dover decides he has no choice but to take matters into his own hands. But just how far will this desperate father go to protect his family? Dr. Ryan Stone (Sandra Bullock) is a brilliant engineer on her first shuttle mission, with veteran astronaut Matt Kowalski (George Clooney). But on a seemingly routine spacewalk, disaster strikes. The shuttle is destroyed, leaving Stone and Kowalski completely alone—tethered to nothing but each other and spiraling out into the blackness. The deafening silence tells them they have lost any link to Earth…and any chance for rescue. As fear turns to panic, every gulp of air eats away at what little oxygen is left. But the only way home may be to go further out into the terrifying expanse of space. From Academy Award®-winning filmmaker Peter Jackson comes “The Hobbit: The Desolation of Smaug,” the second in a trilogy of films adapting the enduringly popular masterpiece The Hobbit, by J.R.R. Tolkien. The film continues the adventure of the title character Bilbo Baggins as he journeys with the Wizard Gandalf and thirteen Dwarves, led by Thorin Oakenshield, on an epic quest to reclaim the lost Dwarf Kingdom of Erebor. Having survived the beginning of their unexpected journey, the Company continues East, encountering along the way the skin-changer Beorn and a swarm of giant Spiders in the treacherous Mirkwood Forest. After escaping capture by the dangerous Woodland Elves, the Dwarves journey to Lake-town, and finally to the Lonely Mountain itself, where they must face the greatest danger of all—a creature more terrifying than any before, which will test not only the depth of their courage but the limits of their friendship and the wisdom of the journey itself—the Dragon Smaug. Set in Los Angeles, in the near future, “Her” follows Theodore Twombly (Joaquin Phoenix), a complex, soulful man who makes his living writing touching, personal letters for other people. Heartbroken after the end of a long relationship, he becomes intrigued with a new, advanced operating system, which promises to be an intuitive and unique entity in its own right. Upon initiating it, he is delighted to meet “Samantha,” a bright, female voice (Scarlett Johansson) who is insightful, sensitive and surprisingly funny. As her needs and desires grow in tandem with his own, their friendship deepens into an eventual love for each other. From the singular perspective of Oscar®-nominated filmmaker Spike Jonze comes “Her,” an original love story that explores the evolving nature—and the risks—of intimacy in the modern world. Comedy. 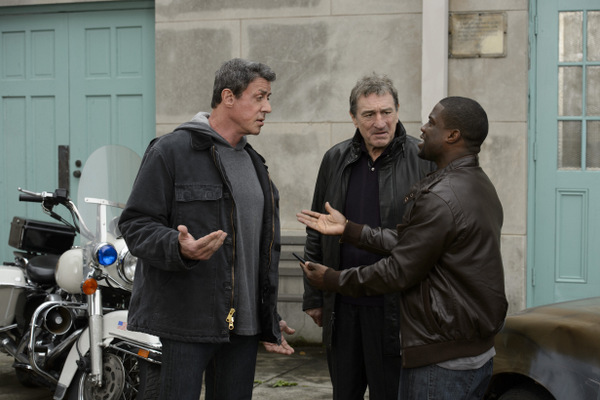 Award-winning movie legends Oscar® winner Robert De Niro (“Raging Bull,” “Silver Linings Playbook”) and Oscar® nominee Sylvester Stallone (the “Rocky” films, “The Expendables”) star as old boxing rivals who come out of retirement for one final match. De Niro and Stallone play Billy “The Kid” McDonnen and Henry “Razor” Sharp, two local Pittsburgh fighters whose fierce rivalry put them in the national spotlight. Each had scored a victory against the other during their heyday, but in 1983, on the eve of their decisive third match, Razor suddenly announced his retirement, refusing to explain why but effectively delivering a knock-out punch to both their careers. Thirty years later, boxing promoter Dante Slate Jr., seeing big dollar signs, makes them an offer they can’t refuse: to re-enter the ring and settle the score once and for all. But they may not have to wait that long: on their first encounter in decades, their long-festering feud erupts into an unintentionally hilarious melee that instantly goes viral. The sudden social media frenzy transforms their local grudge match into a must-see HBO event. Now, if they can just survive the training, they may actually live to fight again.